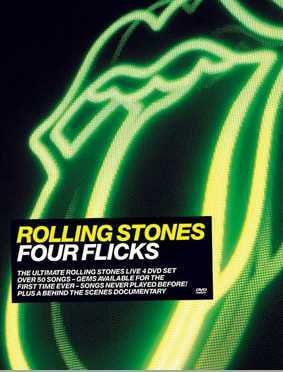 A 4 DVD set in digipack form, will be released worldwide in November. The "Tip of the Tongue" documentary features footage from such films as Cocksucker Blues, Charlie is My Darling, Rolling Stones Gather No Moss and Gimme Shelter. Musical snippets include early versions of Don't Stop, Key to Your Love and Losing My Touch in Paris ... Toronto rehearsals of Dance, Pt. 1, Slave, Time is on My Side, Live with Me and Rip This Joint ... Palais Royale selections It's Only Rock 'n' Roll, Heart of Stone, If You Can't Rock Me ... Boston FleetCenter rehearsals of Can't You Hear Me Knocking, How Can I Stop, Street Fighting Man and Happy ... Gillette Stadium rehearsals of Worried About You, Midnight Rambler, Sympathy for the Devil and You Can't Always Get What You Want ... and Street Fighting Man from opening night at FleetCenter. 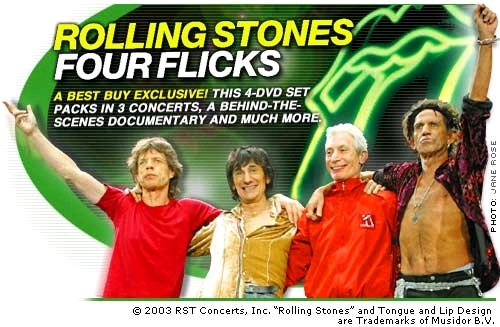 DVD 1 contains 2 documentaries: "Tip Of The Tongue" (May to August 2002, from recording in Suresnes near Paris to the Toronto rehearsals) and "Licks Around The World" (the Licks Tour). The other DVDs cover the shows in Madison Square Garden (New York, 18 Jan. 2003), Twickenham Rugby Ground (London, 24 Aug. 2003) and the Olympia Theater (Paris, 11 July 2003). - Select-a-stone : on some tracks, chose your point of view and see the show while following only Mick, Keith, Ron or Charlie. - Audio commentary : the Stones talk about their songs. - Backstage pass : see what happens behind the scene. Dolby 5.1 surround and PCM stereo. For more Stones news see IORR 49 of November 2003!